Forden was a large workhouse serving 20 parishes. On the 1891 census there were 50 men, 34 women , and 36 children - a total of 120 - residing there. Compared to Llanfyllin Workhouse, it had a large staff who were resident in the workhouse. In addition to the Master, Matron, Porter and nurses that Llanfyllin employed, Forden was able to retain its own schoolmistress, cook, general servant and seamstress/porteress. Powys County Libraries "What a wonderful advance humanizing influences and ideas have made during the last quarter of a century. I don't know whether any of Stead's "Helpers" have been moving about in this locality, but the amount of interest taken in the comfort and enjoyments of the poorer classes to-day, as compared with what it was formerly, is most remarkable. 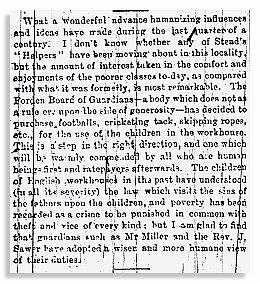 The Forden Board of Guardians - a body which does not as a rule act upon the side of generosity - has decided to purchase footballs, cricketing tack, skipping ropes, etc., for the use of the children in the workhouse. This is a step in the right direction, and one which will be warmly commended by all who are human beings first and ratepayers afterwards. The children of English workhouses in the past have understood (in all its severity) the law which visits the sins of the fathers upon the children, and poverty has been regarded as a crime to be punished in common with theft and vice of every kind; but I am glad to find that guardians such as Mr Miller and the Rev J Sawer have adopted a wiser and more human view of their duties."